MERIDEN -Sylvia Winslow was born on May 29, 1947, and passed away on Sunday, Jan. 22, 2017. She lived in Meriden for most of her life and was a resident of Sanford, N.C. at the time of her passing. 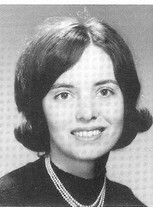 She was a graduate of Central Connecticut State University, and a retiree from Yankee Gas. She loved knitting, gardening, traveling, cake decorating, and doting on her four grandchildren. She is survived by her husband, Jonathan K. Winslow; her two sons, Jon (Heidi,) of Yorktown, N.Y., CJ (Heather,) of Sanford, N.C.; and her brother, Ronald Felix, of Solebury, PA. She will be deeply missed by all those whose lives she touched. A memorial service was held at St. Andrews Church, 20 Catlin St., in Meriden on Saturday, April 22. So sorry to hear about Sylvia, I just heard of her passing . I'm sending my condolences to the family, hope they are all doing okay. I remember all the fun we had in grammar , junior and high school. I knew Silvia through her husband who is a ham radio operator and a member of the Meriden Amateur Radio Club. I'd seen Sylvia at our events but did not realize that we graduated together. I don't think she remembered either.